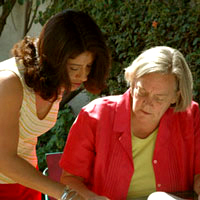 Oaxaca Spanish Magic is a small but excellent Spanish school in Oaxaca where you will discover the magic and the joy of learning Spanish. 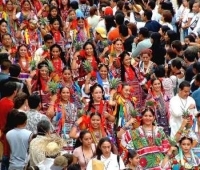 For the last seventeen years, the founder and director of Oaxaca Spanish Magic, L.A.E.T. The director has successfully taught students of all ages, starting from their specific levels of Spanish competency and taking them to the proficiency they want. In addition, she has coordinated and developed Spanish language programs for other institutes, where she has also been responsible for teacher selection and evaluation. 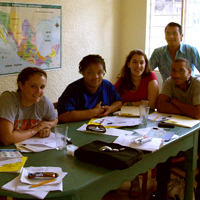 The director personally checks to make sure that each student is content with their program and happy with the progress they make learning Spanish in a very short period of time. She is not only the founder and the director of the school but also a teacher because as she says, "it is a pleasure to teach Spanish and I feel enormous saisfaction when I hear my students put what they learn into practice." From her study of the ways people most easily learn a language and learn it lastingly, she has established her own Spanish language school to offer a different approach to language instruction. Regardless of where you start, you will gain immediate confidence, and you can hear your own progress every day. How is this possible? Magic? Yes. Every aspect of your learning Spanish is designed with you in mind: from her comprehensive work sheets and books, to in-class exercises, to your homework assignments. Classes are lively and informal, whether they comprise a small group or are part of an individual tutorial. The teachers explain everything in a very comfortable and friendly class environment. 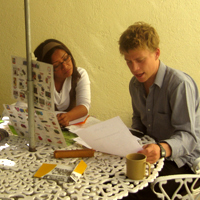 All Spanish Magic programs are tailored for the specific needs and preferences of students. Students enjoy their classes passing thorough the levels of basic, inermediate and advanced. 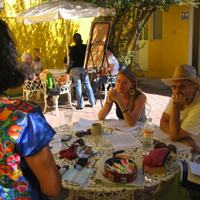 Conversation and personal practice are emphasized, with core programmatic content that links the interests of students with the culture, history and art of Oaxaca and surrounding communities. 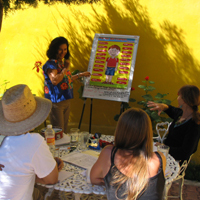 Quality of individual learning is the prime consideration at Oaxaca Spanish Magic. Pace and intensity are designed for flexibility. Practical conversational usage is stressed (including idiomatic usage), but grammatical correctness is never sacrificed. Learning "the rules" is spirited due to the enthusiasm and support of the teachers. So what is the setting for learning Spanish? Totally delightful and exceptionally convenient! 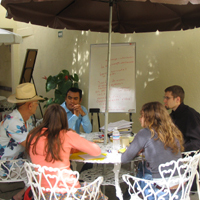 Classes are held indoors and out in the garden of a Oaxaca home five blocks from the zócalo and adjacent to the Cathedral of Santo Domingo.